We have been invited by a prophet who attended the inauguration ceremony earlier this week to exercise our faith and pray for the 44th President of the United States of America. This is not a strange or unusual request and one that I am sure can be appreciated by people of all faiths. President Obama needs our faith and prayers. 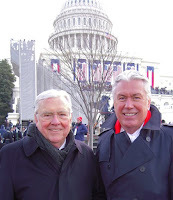 President Dieter F. Uchtdorf, second counselor in the First Presidency of the Church of Jesus Christ of Latter-day Saints, and Elder M. Russell Ballard of the Quorum of the Twelve attended the inauguration and the National Prayer Service the next day. The two represented President Monson as they attended the events. I like what President Uchtdorf had to say to the media after the events. He said that he prays for President’s Obama’s success in leading this country. Compare that to what popular commentator Rush Limbaugh said recently when he expressed that he hopes that President Obama fails. He later qualified that to be his policies. I have always enjoyed President Uchtdorf’s positive outlook on life. Every time he speaks, he seems to express optimism and hope. I need more of that in my life. As he expressed to the media, these are important principles of the gospel of Jesus Christ. He pointed out that President Obama is also focused on these high ideals. Isn’t it amazing how a person who is full of hope and optimism always seems to see the bright side of life? It makes you want to know that person better and figure out what makes them tick. In the case of President Uchtdorf, I think he was born with that natural optimism. It is a gift that we need more from our leaders today. After the National Prayer Service, President Uchtdorf said he felt deep emotion and great unity among the people. He said he hoped that feeling of unity would continue through the years of President Obama’s administration. He also said he felt that the people of America are going to unite behind the new U.S. president. President Monson said that it is always an honor for the Church to be represented at the inauguration of a new president. “We send our best wishes to President Obama and pray for the blessings of a loving Father in Heaven to be upon him and his administration.” President Uchtdorf reported that he felt those blessing there. “We felt we were in the right place with all those whom we call brothers and sisters, to pray for this presidency, for this administration, and with them to pray for all the governments around the world to bring again peace and prosperity and unity to all countries.” I join my faith and prayers with our First Presidency. We are facing difficult economic times. Some have expressed that they fear we will move right past a recession and into a depression. That could be catastrophic. In times like this, prayers for unity and success for the leader of our nation and in effect, the free world, are very appropriate. Many hope for a new positive change. The start of a new administration brings optimism and hope for those who believe in the needed change. I confess that I am not one who likes change. I like routine and steady progress. I’m not sure if a government can bring about the correction to our economic situation but I’m exercising my faith and prayers as we go forward. A change in power in a nation is always a historic event. In our democracy, we show to the world how that peaceful transition takes place. Liberties, freedoms and justice for all are not just hollow phrases but truly are principles of our great nation that we uphold. This is more than just a racially historic event in America. President Obama is young and somewhat inexperienced. He has wisely chosen to surround himself with more experienced individuals. Just as we pray in the church for our prophet and those who surround him, we can do the same thing for the leader of our nation. Carol and I often prayed for President Bush and his family. If you have read many of my past essays, you could probably ascertain that I am very conservative in my political persuasions. I have written previously about Rush Limbaugh and how I enjoy listening to and reading his commentary on the political process and other events in this great democracy we call the United States. I like many of the things that Rush says and agree with a lot of his viewpoints. However, in this instance, I am going to follow the counsel of a prophet and hope and pray that the objectives of our newly inaugurated president can be met. In fact, President Uchtdorf expressed that we need to help President Obama in his task. I’m not sure if there is much I can do for President Obama from way out here in California. I will pray for him and his family just as I did for President Bush. Of course I will continue to pay my taxes and obey the laws of the land as best I can. I will contribute to the economy by buying needed goods and services as usual. I think something else I can do to help President Obama accomplish his objectives is to not criticize. I plan to withhold judgment of the man and his policies until I see how well they work. I confess that I have initially disagreed with his efforts in the economic crisis, but then I also disagreed with what President Bush did there. I am of the opinion that what is happening in the world around us may be beyond the help of a single nation. It may require the uniting of the world in a way that we have not considered before. I strongly suspect that President Obama is the man to do that like no other president we have ever had before. I will be watching him. I will probably not agree with some of the things he proposes. But as things get worse, economically speaking, and I believe they will, I suspect that we will be in for some drastic measures that some will interpret as infringing upon our civil liberties. That happened with President Bush and I suspect it will happen again. I have noticed that I have been somewhat pessimistic over the last few months. My father is dying and I am struggling with what that means in my own life. I have much I want to accomplish before my time is up in this world and my father’s health reminds me that time is a precious gift that we can never, ever get back. The Lord did not say don't [criticize], He said to [criticize] righteously. When so many of Obama' stated goals are in direct conflict of what we have been taught regarding agency and freedom, are we really expected to sit on the sideline and not voice an opinion, or teach? Of course it does no good for the nation to hope for his failure, this would be in contradiction of what we have been told by a prophet of God today: to pray for President Obama. What should we pray for? Maybe that he will be successful in the oath that he has sworn by: to defend the Constitution. I am in complete agreement with the basic message of this post. The problems our country faces are immense. This is NOT the time to hope a new Presidents fails. Our devotion to America should be greater than our devotion to some political party or theory. Sorry to hear about your father. Such a situation is undoubtedly painful. I wish your family the best. Hi Utes, thanks for visiting my blog and adding your comments. I suspect that President Uchtdorf was referring to President Obama's economic recovery goals. We can read in the headlines today of some of the things that President Obama has already done that we disagree with as a church. In particular, he has has lifted a ban that pays for abortions and has said that we need to repeal DOMA - the Defense of Marriage act. So yes, you are correct that some of President Obama's stated goals are in direct conflict with what we believe. And of course we can and should voice our opinions and teach the words of the prophets on matters of agency and morality. We need to express ourselves and clearly make our beliefs known in areas that we believe will have a direct impact on our nation, our families and our freedoms. I've been meaning for a long time to write about what the prophets have said in the past about the destiny of this nation. I think a lot of people will be surprised to learn that it is doomed to fail and to be disintegrated. What? Yes, prophets have said that and I'll share the quotes in a future essay. But that day is not here yet so let's give our nation and our new President the benefit of our faith and prayers as we have been asked by President Uchtdorf. I think, no, I know, that the day will come when the only people who uphold the principles of the Constitution of the United States are the Latter-day Saints. That has also been prophesied and taught by many prophets over the years. When this nation does fail and dissolve, we will be the only group of people who believe in and stand by the Constitution. The people of the earth will flock to us for safety because of that stand and firm commitment. Thanks again for your comments. And just to make it clear, no I didn't vote for Obama. I voted for the other man even though I wasn't too impressed with what he had to offer. I also knew shortly before the elections that Obama would win, so he has managed to get the majority of America to believe in him and what he stands for. Think about it, that is a major prophetic event that we can read about in the Book of Mormon. Enough of my ramblings. I'll add more on the subject in the next post which I plan to do on the prophesied collapse of the government of the United States. And it's not just America that will fail, it's all governments of the world. The timing is the only thing that I am uncertain about. In the meantime, let's follow the counsel of a prophet and pray for our nation and President Obama. We put dad in the hospital two weeks ago and he has not improved. One of my dear sisters has taken time off from work to care for him. He can't even feed himself and barely eats anything. Yet when we gave him a blessing, the spirit indicated that it was not yet his time to go. Just last night he took a turn for the worse so maybe that time has now arrived. That's why blogging has been light for the past few weeks. The time that I normally write on the weekends has been spent in a more important and rewarding use as we have visited with dad and have tried to cheer him on. Alas, he misses mother and just doesn't seem to have the desire or motivation to want to stay longer. I am also sceptical about Obama, mainly because I don't trust popular tendencies when they are about folowing blindingly a star-like picture of a politic representant. But I really enjoyed his speach. I may be sceptical about the next 4 years but I believe his is sincere and he is a good man. I am sorry to hear about your father. If you tell me what he means to you- maybe I could write a poem for you to give to him. He must really miss your mom. I have "magical optimism" and have decided that the time that mrs. obama came to visit church headquarters could have planted a seed. That her tender nature might be receptive to gospel principles. They are looking for a new church? Perhaps she will take on an interest in genealogy. She did give mrs. bush a gift of a journal to write her history in. Never underestimate the power of a wife for good. He is a young president and his stand on abortion and gay marriage saddens me. But, perhaps he will develop good relationships with romney or other good minds for our economy's sake. I will pray for his wife and for those around obama. That he will be surrounded by good minds and not fall to corruption. That he will seek for the guidance of God to direct his path. The world is becoming ever more global. And searching for good while being more critical. We all need something to believe in. I will believe in prayer and direct my thoughts in possibilities. Hi backandthen: Thanks for the visit and the comment. I hope all goes well for you on your exam. I am hoping you are right about Obama being a good man and wanting to do the right thing. I just hope he gets good advice from those he has placed in his inner circle. I sometimes wonder about how much of what we blame Bush for was actually because of bad advice from others. I hope Obama reaches out to the world more than we have as a nation for the last few years. You can read more about my dad on this essay from back in September. But to add a little bit more, I'll share the following: My dad is one of the most unselfish people I know. He loved to help other people and you could tell that he found joy in it. The only thing that dad liked for himself was to collect recipes and try them out on others. He has a huge collection from years of cutting out recipes from magazines. He had a talent of being able to take a recipe that serves four or five and expand it to feed a hundred or more. That was when he was happiest - when he was in the kitchen supervising meal preparation for a large gathering. Dad was a simple man and didn't seem to have any desire to excel in life other than to serve and help others. Because of that he was always recognized with awards and honors by the communities he served. He was also placed in charge of teams and departments both in the military and in his career in the retail food industry. But I think what I appreciate most about dad is the great example he set for me of loving my mother. He was a saint in that area. I don't know how he was able to put up with her difficult personality other than being blessed with the gift of tolerance and patience. He never, ever raised his voice at my sisters or me and was always approachable even though he was very busy with work all his life. My sisters have taken time off from work over these past three weeks to care for him. That shows how much they adore him. He has always been so soft-spoken and slow to complain. He also easily expresses appreciation for what others do for him as he can no longer really take care of himself. I think he got his kind and easy-going personality from his mother, who would also do anything for you and often did. In short, dad is not the kind of man that could lead a nation like Obama, but he is the kind of man you would want to have at the head of a family that included lots of daughters that needed security and stability as they were growing up. My dad was and is that kind of man. It has taken me years to realize how great a talent that is and to see how much it has been appreciated by the women in his life. I think that's why he had so many loyal customers over the years. He just had a way of helping people feel good about themselves, especially women. Being his son was a special and unique experience because I got to see firsthand how women should be treated - always with kindness and respect. He never judged, he never mocked, he never said, "I don't understand you. Why can't you be more like a man?" Maybe it was because had two sisters as he was growing up - one older and one younger, but I think he brought his gifts with him from heaven. Thanks again for asking about my dad. I hope you can tell that I am proud of my dad and what he has accomplished with his life. In the eyes of the world he did very little. In my eyes, he is a great man because he showed me what was really the most important thing in his life - his wife and my mother. Yes, he misses her and it has been hard for him to be without her these past four years. I think that is why he is recovering so slowly. I suspect that he wants to go be with her. My father has a gift of being able to discern the presence of angels. He has shared it with me on several occasions. Most recently he shared with my sister, who has been helping him in the hospital this week, that mother was with him the night before when he was having an especially difficult time with his deteriorating body. We treasure these moments with my dad when he confirms to us the reality of the spirit world and our family relationships there. Thanks for your continued visits and your comments, Kelly. I very much enjoy reading your poetry each time a new one shows up in my blogroll on the sidebar. You are a talented woman. God bless you and your family. I have to say I want him to be the best President he can be. I also hope that America is blessed as he leads the nation. But I think that the best way for him to succeed is to not accomplish his foolish communist policies. I think we as latter-day saints should pray that his heart will be changed. We should pray that he will follow the constitution.